When the opportunity presents itself, I try to interview comedians who are making headway in their stand-up comedy adventures — from different perspectives, different geographical locations, different experience levels, different goals, etc. Bob has also managed to turn his comedy talent into a noteworthy income in a very short period of time. My interview with Bob is provided below and is broken up into 7 brief, but focused YouTube video segments (the total interview was about 25 minutes long). Even though Bob has only been doing stand-up comedy for a couple of years, he has made some tremendous headway in a very short period of time. I should also mention that Bob is also a contributor to the Corporate Comedy Secrets Audio Training package provided as an upgrade to the Killer Stand-up Online Course. But he also provided a very detailed written outline of how he was able to work with a team of comedians to start generating income quickly as a corporate comedian. 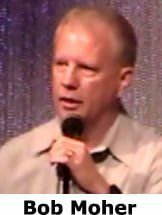 This entry was posted in Stand-up Comedy Tips Archive and tagged audio interview, comedian Bob Moher, comedians, comedy career, corporate comedy, stand up comedian, stand up comedy, youtube by Steve Roye. Bookmark the permalink. Wow, Steve! I really enjoyed this interview with Bob Moher. Lots of great helpful information here! Thanks so much to both you and Bob! ← Previous Previous post: How Should Comedians Deal With Critics? Next → Next post: Will Learning Stand-up Comedy Help Me Be Funnier At Social Functions?